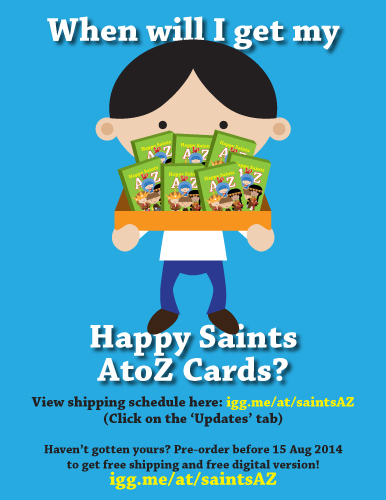 The Happy Saints A to Z Cards’ successful crowdfunding campaign is now reaching 120%, a BIG THANK YOU to over 200 contributors! Please check out the shipping schedule for your perks and rewards. Download links to digital versions will be emailed to contributors from 15 August 2014 onward, to your emails registered on Indiegogo. Please allow a few business days to receive yours. Posters will be shipped to contributors in hard tubes from 30 August 2014 onward, to your shipping addresses registered on Indiegogo. Please allow 10 - 14 business days for shipping. Cards will be shipped to contributors in bubble envelopes from 15 September 2014 onward, to your shipping addresses registered on Indiegogo. Please allow 10 - 14 business days for shipping. Custom artworks will be emailed to contributors from 30 September 2014 onward, to your emails registered on Indiegogo. I do appreciate your patience if it seems too slow. There is a lot to prepare and produce! And as hard as I try, there may be unexpected circumstances and the schedule is subject to change. Thank you for your understanding!